Using the MIR-Method is helpful for many people. However, after you have done the MIR-Method for four weeks, there is a whole set of techniques you can also do. In this online course I will teach you those techniques, and they are awesome! 7. First Aid for injuries. Useful for burns, cuts, bruises, etc Including migraine and nightmares. 10. First Aid with Emotions: Fear, Anger, Sadness. Using the first aid calms your client down quickly. It is strongly advised to first watch the recordings of the online course ‘Deep understanding of the MIR-Method’. This course is meant for professionals. You must have practised the MIR-Method for at least 4 weeks prior to the online course! You can teach the technique to your clients, but they also need to have done the MIR-Method for at least 4 weeks before they can use these techniques. 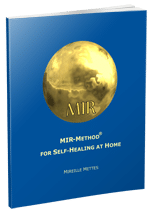 After this course you can watch the online course ‘Deep understanding of the MIR-Method’ to work with the MIR-Method professionally. We recommend to do the ‘Deep understanding’-course first, prior to the additional techniques!